Presentation says a lot about a dish. Whether a recipe is simple or complex, adding interest through the art of visual appeal contributes a great deal to the overall sensory experience of a meal. That's why I love to find simple ways to dress up a recipe without having to buy and store new serving dishes (not that I don't have my share) and without spending a lot in terms of money or time. 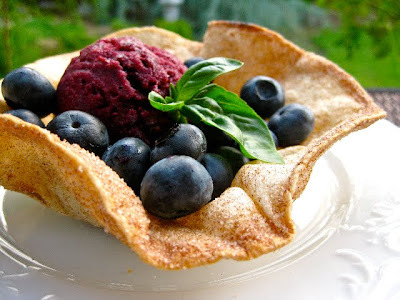 Many people are familiar with salads being served in tortilla shells but what about dessert? And what if you didn't have to deep fry them? 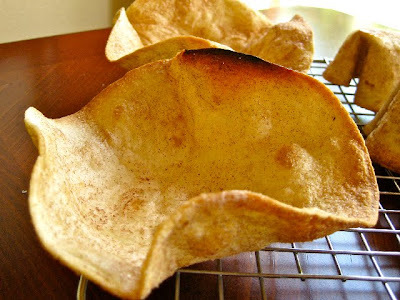 Here is a great way to dress up a dessert with a few taco sized flour tortilla shells, some non-stick cooking spray and a little cinnamon and sugar. You can make it even more fancy by dipping the edge in chocolate or drizzling melted chocolate over the cooled shell if you like, but you don't have to. I didn't here. Cinnamon Sugar Tortilla Cups make a great dessert dish in any season but they seem especially nice for summer. Great for holding fresh fruit, sorbet, even cake and ice cream, these are the ultimate in disposable dishware. Why throw out even recyclables when you can eat these yummy dessert bowls instead? You can make 3 or 4 of these at a time on one baking sheet. 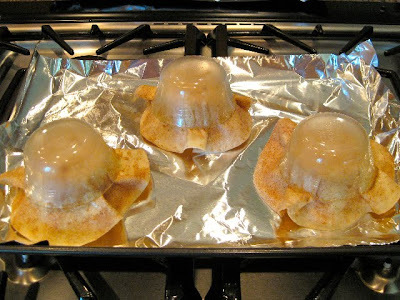 Invert 3 or 4 6-ounce glass custard cups on the foil. Lightly spray both sides of half the tortillas with nonstick cooking spray. Sprinkle each side with a teaspoon or so of the cinnamon sugar mixture. Place another glass custard cup over the top, if you like. This will hold the tortilla shells on the custard cups and make them more upright but it isn't necessary. Carefully slide the baking sheet into the oven. Bake for 10 minutes or until lightly browned and crisp. Remove from oven. Using tongs, remove the tortilla shells from the custard cups and cool right side up on a wire rack. When cool, fill with ice cream, fruit, mousse or other filling of your choice. 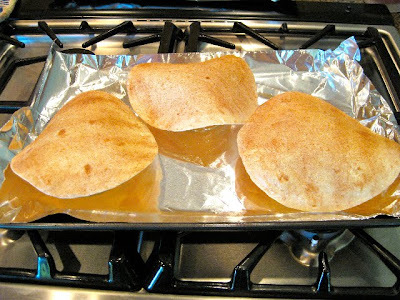 Note: Smaller cups can be made by trimming the tortilla into smaller circles, coating them with sugar as directed above, and fitting them into muffin tins lightly coated with non-stick cooking spray. These I folded a little at the sides to fit them into the tins. They hold a relatively small quantity, just right for some desserts. This is the kind of fantastic idea that I bookmark and then never use. But I AM going to do this! Great idea and fabulous photos! Beautifuls! I just bought some cinnamon sugar pita chips that are pretty good. I'll have to try making these. I love the fancy presentation it lends. Leave it to you, Lisa, to come up with a fantastic idea and a great presentation. This is a wonderful way to serve summer ice cream and fruit. 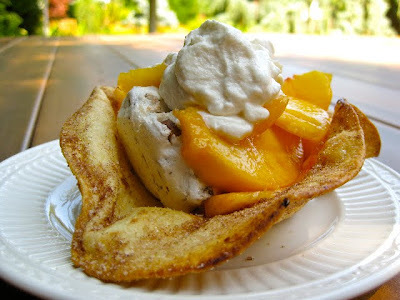 I'm thinking of cinnamon ice cream with fresh mangoes. What do you think? I can't wait to make these. I am having a house full of company and this is a great way to serve a fruit salad and so many other things. This is a great idea for a dessert. Whenever I make tortillas I think I should do sweet ones, looks lovely. What an easy, yummy idea! A sweeter, yummier, and totally cute alternative to icecream cones!